"Our Black History Need Not Ever Be A Black Mystery"
On this day 161 years ago March 6, 1857, The United States Supreme Court, under the stewardship of Chief Justice Roger Taney issued it's most hideous edict. You may say that the 1896 Plessey vs. Ferguson decision legalizing separate but equal facilities was unjust. Yet in the entire history of our highest court in the land. The US Supreme Court which is supposed to uphold this nation to the highest principles of justice. Made the Dred Scott decision that setback entire race of people to the nation's basement of irrevocable inequality. The founding fathers decided that a race of people were only 3/5 human and then Roger Taney and his bench of 9 jurists dug the hole of despair even deeper. Nothing comes close to the decision rendered in this day 161 years ago, today. These white racist jurists who were chosen to ensure humanity's righteousness proclaimed on that day that no black person had absolutely no rights to which a white man had to honor, respect, or validate. This decision's merit was based on the premise that since blacks had no rights of human-hood at the inception of the Constitution in 1787. Then, therefore, our black ancestors were still to be considered no less than property in 1857. Maryland resident and head white supremacist Chief Justice Roger Taney wrote the ruling that would stand forever as a stain on America's stature as a symbol of democracy even after a civil war ended the peculiar institution of slavery 7 years later. Taney was the former law partner of Francis Scott Key before he became the nation's highest jurist on the nation's highest bench. Francis Scott Key, of course, wrote America's Star Spangled Banner. This god-awful federal judicial ruling was one of the primary reasons that America maintained a sense of white supremacy for at least another 107 years. It took the Civil War, 3 constitutional amendments, 1 additional Supreme Court decision in 1955 and the Civil Rights Bills of 1964, and the Voting Rights to lessen and mitigate the pain that was suffered as a result of the Taney's Court's Dred Scott decision. The effects of the Dred Scott decision are still evident in our society today. That's why it is so important for our community to be literate and knowledgeable about our own history. 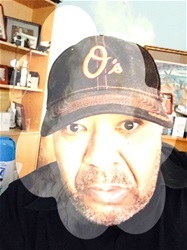 So that we as a community can defend against any judicial efforts of our federal and state courts or government who may attempt to turn back the historical clock of injustice. We can allow the suppression of any gains/progress we have attained over the course of history that were established to protect our citizenship rights. 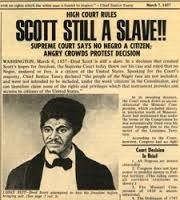 Dred Scott sought and fought for his freedom as a man. He may have lost his battle in the nation's highest federal courtroom on this day 161-years-ago but we honor the memory of his battle.